If you are saying the rosary as a group or family, the prayers below are broken down into parts prayed by the leader (V:) and the group (R:). Otherwise, in private prayer, the prayers are said in their totality. V: I believe in God, the Father Almighty, Creator of heaven and earth; and in Jesus Christ, His only Son, our Lord. He was conceived by the power of the Holy Spirit, born of the Virgin Mary, suffered under Pontius Pilate, was crucified, died and was buried. He descended to the dead; on the third he arose again and ascended into heaven where he sits at the right hand of God, the Father Almighty; from thence He shall come again to judge the living and the dead. R: I believe in the Holy Spirit, the holy catholic church, the communion of saints, the forgiveness of sins, the resurrection of the body and life everlasting. Amen. R: Give us this day our daily bread; and forgive us our trespass, as we forgive those who trespass against us. And lead us not into temptation; but deliver us from evil. Amen. For the virtues of Faith, Hope, and Love. V: Hail, Mary, full of grace; the Lord is with thee; blessed art thou among women, and blessed is the fruit of thy womb, Jesus. R: Holy Mary, mother of God, pray for us sinners now and at the hour of our death. Amen. V: Glory be to the Father, and to the Son and to the Holy Spirit. R: As it was in the beginning, is now and ever shall be, world without end. Amen. All: O My Jesus, forgive us our sins, save us from the fires of hell. Lead all souls to heaven, especially those in most need of thy mercy. All: Hail, holy Queen, Mother of Mercy! Hail our life, our sweetness, and our hope! To thee do we cry, poor banished children of Eve; to thee do we send up our sighs, mourning and weeping in this valley, of tears. Turn, then most gracious Advocate, thine eyes of mercy toward us; and after this our exile show unto us the blessed fruit of thy womb, Jesus; O clement, O loving, O sweet Virgin Mary. R: That we may be worthy of the promises of Christ. 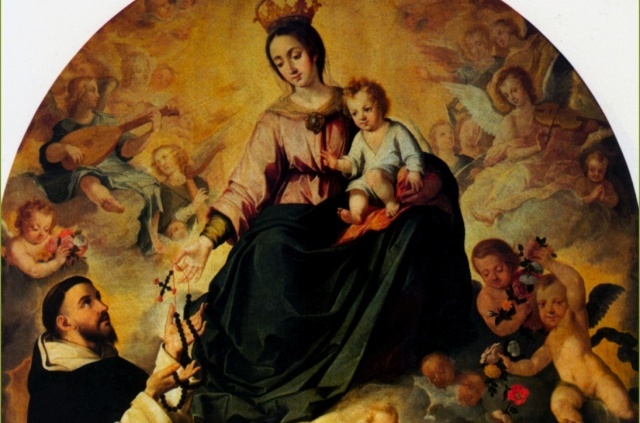 V: O God, whose only begotten Son, by His life, Death and Resurrection has purchased for us the rewards of Eternal Life, grant we beseech thee that by meditating on these mysteries of the most holy Rosary of the Blessed Virgin Mary, that we may imitate what they contain and obtain what they promise through Christ Our Lord. Amen. V: May the Divine assistance remain always with us. R: And may the souls of the faithful departed through the mercy of God, rest in peace. Amen. The prayers of the Rosary must be prayed vocally and must mediate upon the Mysteries of the Rosary. If the recitation of the Rosary is public, the Mysteries of the Rosary should be announced. One may gain a partial indulgence for the Rosary’s recitation in a whole or in part in other circumstances.